Devil's Punch Bowl is a 37-metre ribbon waterfall on the Niagara Escarpment, in the Stoney Creek community of Hamilton, Ontario, Canada. 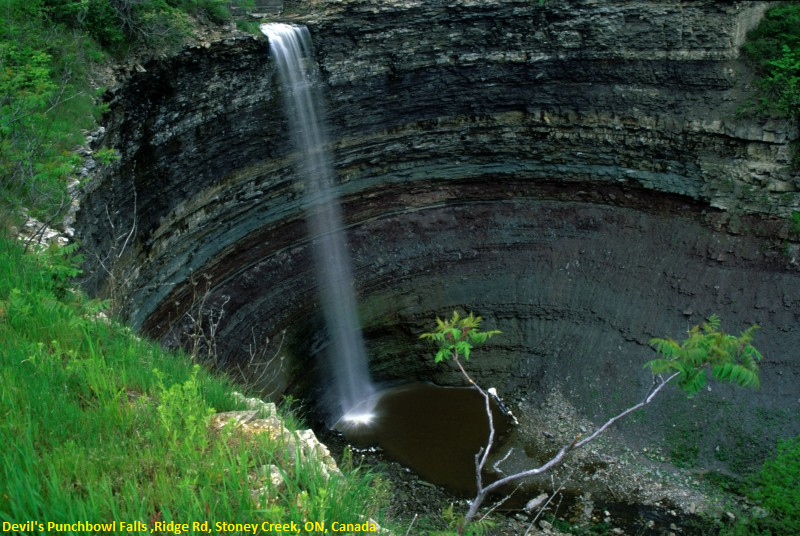 It is found in the Devil's Punchbowl Conservation Area, maintained by the Hamilton Conservation Authority,and features an escarpment access trail with connections to a recently improved section of the Bruce Trail. Stoney Creek's Dofasco 2000 Trail is nearby.The Punch Bowl is also known as Horseshoe Falls for the distinctive shape of the cliff-face, which somewhat resembles its much larger cousin. To reach the Devil’s Punchbowl by car, exit from the QEW onto Centennial Parkway South. Go up the escarpment until you reach Green Mountain Road, then turn left. Go left again on First Road East, and follow the signs. To reach the Devil’s Punchbowl via a walking trail, take the Stoney Creek section of the Bruce Trail or the Dofasco 2000 Trail.